Thanks again to our secretary Mark for putting these minutes together! We are now back into things again after the Christmas break. The committee dinner was a great opportunity to get to know each other better and we will try and do these a few times a year to help strengthen our bond as a team. Patreon is up and posting more to come later in the meeting. There isn’t a lot of new news on this front at present, we are overhauling the membership sign-up process and database to make things more efficient. We currently have about $17 in the account, the first of the Patreon payments won’t come through until the start of the next month. The Hills ritual went really well and they are hoping to be able to do something like this again in the future. The feedback was overwhelmingly positive. The numbers continue to go well for the city meetup, with a good regular attendance, there is going to be a slight change to the discussion format as it moves forward this year. They are contemplating doing a Facebook live at a future event. Ballarat meet-ups are still in discussion with the possibility of running four a year on the table at present. 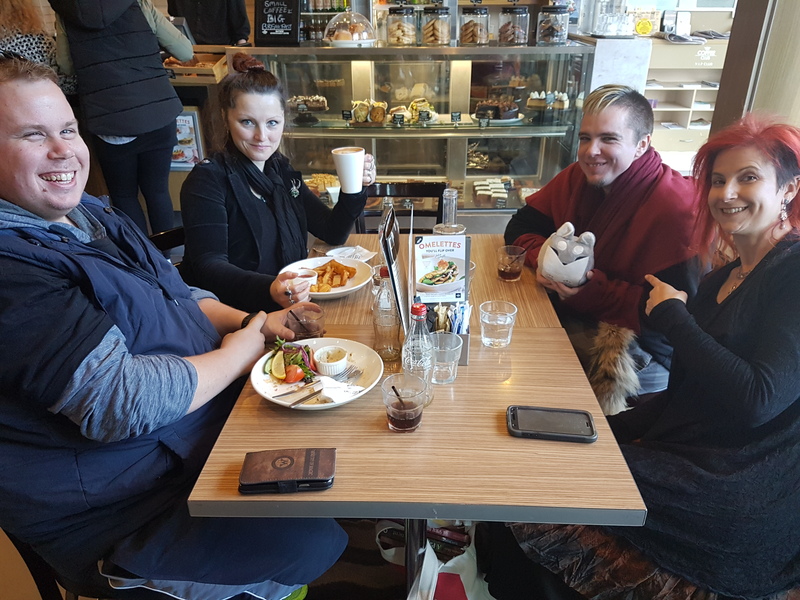 These meet-ups are still continuing on and are going well with some regular faces as well as new faces turning up each meeting. The first Swinburn pagan event will be coming up soon, it is very exciting. The side is still continuing on in 2018, working on getting the skills up ready to be performance ready. They are attending English Ale in May. They have begun learning a second dance (Dilwyn) and are practicing processionals. Patreon is now live and posting. Thank-you to everyone that has supported, contributed to and worked on getting it live. Also a big thank-you to everyone that has become a backer, or been helping share it around. The overhaul is well underway and now blog posts immediately post to the Facebook as well. The site is getting anywhere from 50 – 200 hits a day. That is frankly amazing. The stats are up really well, so please continue to share and interact with it to help keep this up. We are updating the form so that when a member signs up it sends it straight to our database (which is being overhauled) We will be contacting members to confirm their details and to ensure they know their membership number. Have a lot of articles lined up ready to go throughout March so that our social media will be posting something every day designed to provide the community with access to information that will educate and inform in a variety of aspects of safe community. Yes they are still coming to Melbourne, no we don’t have the date yet but will be posting more about it when we do. This will be branded as a PCV presents event. The date has been selected as April 7th. Sarah will be drawing up a list of speakers and presenters for the various traditions and paths in Victoria as well as the various groups currently running events open to the public. It has been proposed that we have a Druids v Witches Kubb game on the day, it will be a light-hearted thing, designed to be entertaining. Autumn Equinox – we currently don’t have someone running the equinox now that Pagan Pride Day is in April. We now have an Instagram that is being run by Dorian at present. It can be found by looking for pagancollectivevic. It would be great if we can start announcing some of the dates for workshops, so could the committee members who have volunteered to run workshops please start trying to work out the dates for their workshop. These will probably be 1 – 2 hours in length and $10 – $15 for non-Patreon backers. Ryan is investigating chat bots with involves direct engagement content with users. He is currently learning about how to use them and will run it when this gets off the ground. It was raised that we should consider changing some of the language on our website and social media to make it more inclusive. It can sometimes come across as slightly Wicca or eclectic witchcraft centric and it would be a shame if that made people from other paths feel left out. Safely nestled inside The Last Jar, protected from stormy Melbourne weather outside, the May CBD moot was a huge success with several new faces and many regulars in attendance. So we broke a personal record at the last meet – 27 people came along, we ended up co-opting three more tables in addition to our regular long table, there was a lot of fun had, and more good conversation than I could keep up with. Effusive thanks to everyone who helped make the day so utterly marvellous – we’re already excited for the next one! Come along! At the June 2017 Hills Meet. Photo by Sarah. Safe and warm inside the Coffee Club sheltered from the stormy weather, the Frankston/Cranbourne meet enjoyed its biggest turn out yet. Featured photo by Kylie Moroney.